Douglas Brooks Boatbuilder - Welcome! This is the first comprehensive book in any language on traditional Japanese boatbuilding. It is my fourth book on the subject, encompassing all five of my apprenticeships throughout Japan. Only books ordered from this site can be inscribed and all copies sold here will be signed by the author. Winner of the 2014 Rare Craft Fellowship Award, given annually by the American Craft Council in association with The Balvenie, a Scottish distillery, honoring people "who demonstrate a contribution to the maintenance or revival of rare craft techniques." Chosen from among hundreds of candidates nationwide, a panel of curators chose five finalists and one fellow. The award comes with a cash prize and a two week residency in Scotland sponsored by The Balvenie. I build wooden boats for private clients, museums and municipalities. I specialize in American, English and Japanese traditional boat designs. In the case of western boats, my methods range from traditional plank-on-frame construction to glued lapstrake, and sometimes a hybrid of traditional and modern where I feel it is best for the longevity of the boat and the needs of the client. For Japanese boats, I build as accurately as possible, sometimes substituting domestic materials when necessary. Costs of boats vary based on design and materials. Contact me to discuss your needs, as I have a large library of boat plans and sources. My work with museums often takes the form of public demonstration projects. These feature traditional boat building in a setting that makes it accessible to museum visitors. I research the history and design of the boats I build, working with curators, historians and naval architects in developing these projects and maximizing their educational impact. I have also played key roles in project design and fundraising, and often give public lectures and workshops as part of these projects. When working with municipalities, I have been able to include volunteers in work roles and to establish post-building projects which give the public ample opportunity to use the boats and involve the larger community. I also work with museums on research and documentation projects, and consult on boat storage, stabilization and documentation. Contact me to discuss a boat building project. I loft boats full-size on high quality paper for amateur boat builders, and teach workshops in lofting and lines-taking. Costs of projects vary. A lofting for a typical traditional small boat is price competitive with modern plans that include paper patterns. The beauty of having me loft your boat is that you have thousands of potential designs to choose from. Contact me to discuss your needs. I continue to work with elderly Japanese boat builders in order to document the skills and techniques of this vanishing craft. My research is ongoing. Publishing and teaching go hand-in-hand with my research. My articles and photographs are published in magazines in the United States, Great Britain and Japan. 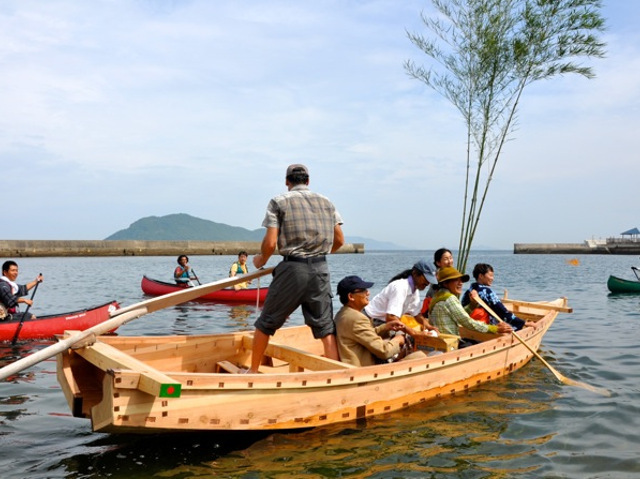 My book, The Tub Boats of Sado Island; A Japanese Craftsman's Methods, is available through my website; in Japan directly from the Kodo Cultural Foundation (www.kodo.or.jp) and in large bookstores in Japan. Contact me about your boat research needs or to order a copy of my book. Lecture fees are based on the organization's ability to pay. Contact me to discuss your interests. I hope you will enjoy looking at the site and I welcome your feedback. Please feel free to contact me if you have any questions.